As you all know by now, I am a huge supporter of getting to know your farmer. The questions are…..Is it working? Aren’t some of these groups big business? Where’s the benefit? Big business super chains like Sysco do have a value. Sysco has been notoriously known as “the canned food” food service portion of the industry. Many colleges across the US have Sysco on campus providing a variety of meals and treats. Why are they important to have at the table for a local foods conversation? There are many factors to be considered. One: Local foods generated sales of fresh local farm goods. A big consumer like Sysco could benefit from networking and connecting with farms within their regions. It’s a win/win situation for the farm, Sysco and for their food consumers. Maybe the ultimate consumer won’t get to know the farmers but the buyers for Sysco will. Businesses like Whole Foods have been out throughout many states across the country utilizing the local foods system. There is one thing that is lacking within their system….a definition of what local foods are. Is there a specific radius (miles)? Are they considerations for sustainable farming practices? Whole Foods does promote animal welfare concerns, which is part of knowing your food. I got it!!! Guess who’s missing? Where o’ where do you see the farmer in this who’s who roll call list of attendees? It’s all a political front. One organized group after another. Followed by big business and Government run organizations. Not one word about the farmers who do the “dirty work” but all about a marketing ploy of knowing your food, not the people behind it. What do you think? Am I mistaken? Speak out, speak up and let your voices be heard! When trying to pick a topic for today’s blog…my mind keeps wandering all over the place. I have no topic that I really want to go in depth on today so I will talk a little bit about what’s been happening here on the farm. I have sat down with the NRCS office, which under Vilsack’s proposal to shut down some offices is on the chopping block, about setting up some intensive pasture areas here on the farm. We have huge issues with erosion and after leasing the land out for the past two years, we have decided that leasing it out was a HUGE mistake. 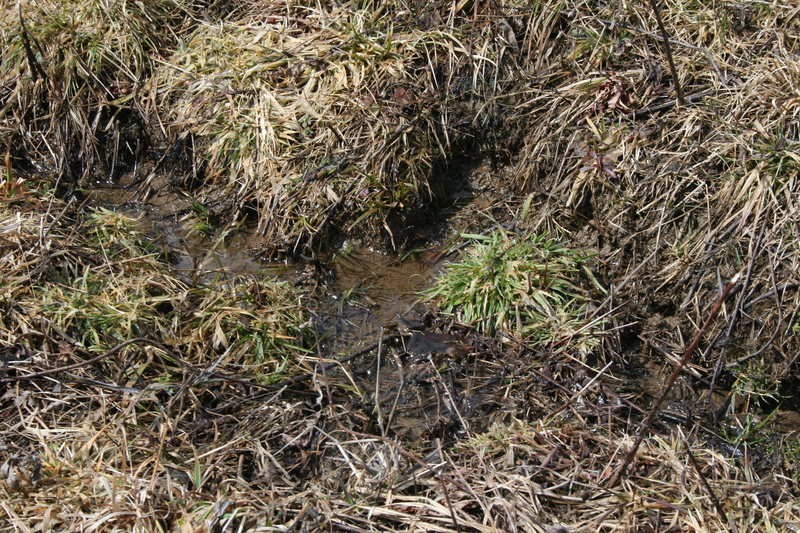 The farmer, who is a big commercial dairyman, decided to not use the topography of the land or have any respect for the natural environment. We now have hills that are plowed straight up and down that the water just runs down like a creek. We are also having some phosphorus contamination issues in our pond as well. More stress that we really didn’t need! What are our next steps? Taking back the land! Using systems like the intense pasture management, controlling water run off and improving drainage are going to be the first steps. It makes me sad to think that we trusted someone to do the right thing and instead they have come close to destroying our beautiful pond. Some people are just idiots and don’t care. Right here is a perfect example of a small farmer trying to do the right thing and a commercial farm with an ego the size of Texas doing whatever he wants to with no regard for anything or anyone. Well, we are putting our foot down. Enough is enough and he will not be allowed to use the property ever again. This is also the guy who seems to think that he doesn’t have to abide by the law either. None of his tractors have lights, he completely disregards the manure spreading laws and he drives about 70 miles an hour down our hill (which by the way is full of blind spots, animals and kids). There are just too many things about this guy that rub me the wrong way. Maybe it’s because I was raised to treat everything with respect. Respect for my environment, my family, the land and even the animals. I know he was raised different too. I actually love his dad. We have very lengthy discussions about farming, God and family. This whole situation is mind boggling and depressing really. I just can’t fathom what goes through his head sometimes. 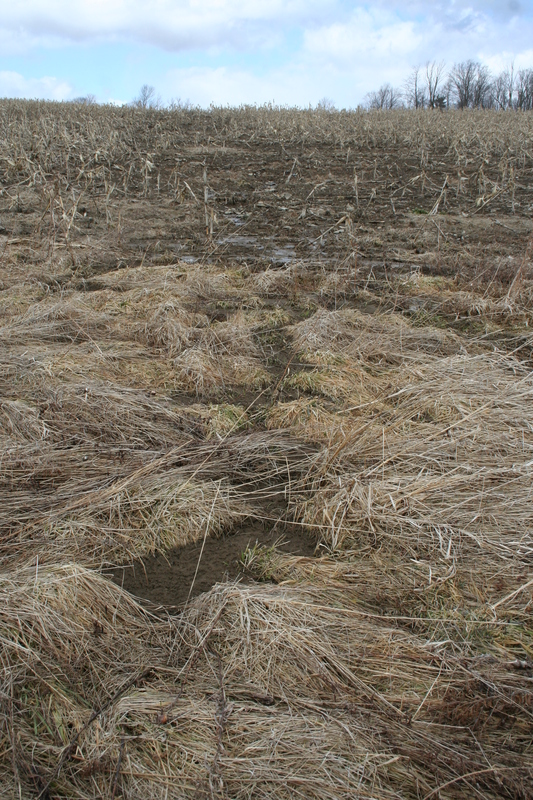 But, back to our farm….We have been approved for a no-till or minimum till for all of our plantings this spring. I am exciting to start getting things back to the way they should be here on the farm! I can’t wait to see the grasses swaying in the breeze and watch the cows out in the pasture munching away on it. I can almost see it in my head now. Lazy times out watching the cows graze, the chickens and turkeys following along digging and scratching for bugs and worms….the sound of the birds chirping. Oh, how I miss warmer weather and the green of the grass! 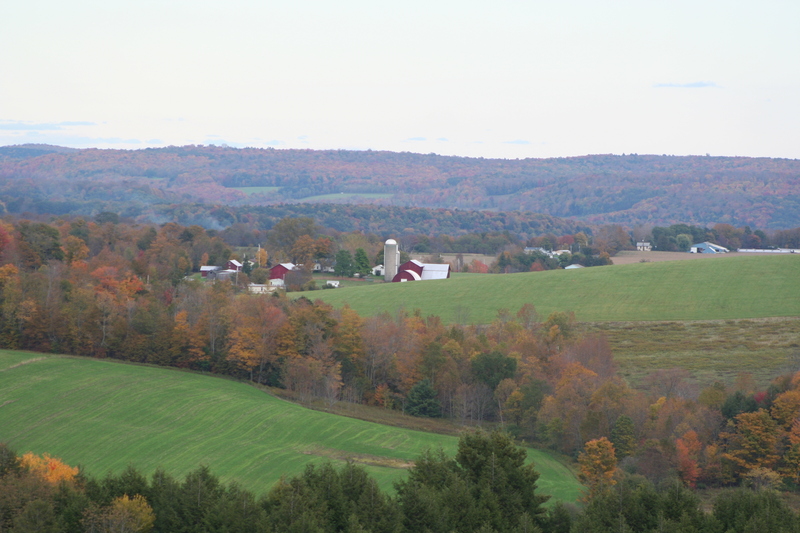 The view from our top field during the fall months. This spring is going to be really busy for us. There is going to be lots of work that needs to get done. We will need to plant, build fencing, finish the exterior of the barn, remodel the interior, build a milk house, cheese room, sugar house and still manage to hold down jobs and attend meetings. But, you know…I look forward to it all! Every last bit of it. If I can manage to get it all done, I will get to live my dream and set an example for others to look at and think about. It almost brings tears of joy to my eyes thinking about it. I can close my eyes and see just how it will all look and I can almost live the moments. So for now, I will take my wandering mind back and go daydream of what the next year will hold in store for me and our little farm. “I would like to write something about the demand for NY dairy generated by greek yogurt. I want to talk about where the money is going, whether farmers are enjoying a premium for the milk that the make or merely getting the spot price to fill a bigger demand. I assume Fage, Chobani et al getting market price,” says Jason Foscolo a Food Law Attorney from Remsenburg, NY. That seems to be a big question lately. After connecting with a representative from Chobani based out of Norwich, NY, I asked how the purchased their milk and if direct marketing was a possibility. DMS is a huge organization, as you can see. They work under the Federal Milk Order for the following maps area that are highlighted in Blue. According to the Federal Milk Order Boston, Massachusetts is the main hub of activity. Anything outlying beyond Boston, Mass is hit with a price differential. Here in our region, our milk would be pooled into the Binghamton, NY location. According to the differential map, the price difference would be -.55 per hundred weight of milk. A friend located just the other side of Syracuse, NY would see a -.75 differential. To view the PDF file on differentials, please click this link. The big question is, why the differentials? The differentials are there to ensure that the milk pooler, groups like DMS, still make a profit as milk is shipped off to the highest use or center hub location. Now, the next questions that arise in this area: With new yogurt manufacturers coming into operation or expanding operations, will milk producers see an increase in payments or premiums? Amazingly, the responses shock many milk producers. When we keep reading in the news how the demand for milk due to these yogurt manufacturer’s is increase and their is a shortage of milk to supply to these same plants. The comments and responses are below. Make sure to follow the links for the full investigation documents. The petitioners cited seasonally lower milk production, year-over-year declining farm production in the Northeast, manufacturing handlers keeping their milk for their own plants, and growing dairy production demand as factors contributing to the tightness in the milk supply. Section 1001.7(g) of the Order allows the Market Administrator to adjust the shipping percentages if, following an assessment of market conditions, it is determined that such adjustment is necessary to encourage needed shipments or to prevent uneconomic shipments. On August 16, 2011, a notification of the request was sent to pool handlers by the Market Administrator while also inviting comments, input, and data regarding the proposed increase. Pool handler HP Hood, LLC. (Hood) was supportive of the request noting that due to drought conditions the Southwestern U.S., a region that traditionally serves as source of additional milk supplies to markets in the Southeastern U.S., will not have extra milk available this fall. As a result, milk marketers in the Southeastern, U.S. will look to milk suppliers in the Northeast as a replacement region for needed milk. In addition, Hood noted slowing milk growth in the Northeast, while at the same time, demand for milk from new or expanded dairy operations within the region has grown dramatically. Hood expressed their concern that fluid plants in the region would be forced to pay “give up” premiums, in additional to the Class I differential and current voluntary premiums, in order to be able to obtain milk volumes necessary to meet school start-up and holiday demand. Pool handler Byrne Dairy Inc. (Byrne) responded to the request for comments expressing their support for an increase in the required shipping percentages beginning in September. Byrne noted significant uncertainty with respect to both the supply and price of supplemental milk that the firm needs to fully supply their fluid milk customers. Byrne also noted a lack of transparency with respect to the current reporting associations that milk suppliers use to comply with the shipping requirements, questioning if an increase to 30 percent would in fact make more milk available to Class I handlers. Cooperative handler Agri-Mark, Inc. (Agri-Mark) responded to the request for comments by stating that they opposed any increase in the minimum shipping percentage for the months of September, October, and November of 2011 at this time. AgriMark stated that the request to increase the shipping percentages was a surprise because the current and anticipated demand for Class I milk in the Northeast does not indicate the need for such action. AgriMark noted that the cooperative’s milk sales to Class I customers were lower in total and individually to most regular customers in July 2011, compared to July 2010. AgriMark noted that the cooperative has not received any requests for spot milk at this time while stating that under a typical year (when no increases in shipping requirement occurred) some requests usually develop by now. It is their conclusion that if anything, demand appears to be less than in the past and not more, noting that they have not heard of any unusual or significant increase in milk needs expected during the September through November period from their customers. Cooperative handler Maryland and Virginia Milk Producers Cooperative Association, Inc. (Maryland and Virginia) submitted remarks opposing any increase in the minimum shipping percentages for the months of September, October, and November 2011, at this time. Maryland and Virginia cited Northeast Order statistics that indicate the volume of Class I sales dropped by 8.3 percent while the total milk pooled on the order declined by less than 5 percent. The cooperative also reported that based on their data and through discussions with other milk suppliers, Maryland and Virginia believes that needed shipments are available already, are being provided, and will continue to be provided this autumn without the need to increase the minimum shipping percentage. Class I handlers recently that would indicate an impending shortage, while also citing order statistics that report recent declines in Class I utilization on the Northeast Order. Upstate Niagara stated the need for more time by handlers in the market to fully consider whether increased shipping requirements are truly needed. If after reading the direct comments of the milk poolers and handlers, you still think that we will see higher payments for milk due to yogurt manufacturing within the State of NY, I think you are sadly mistaken. If the demand has not increased, no higher payments or premiums will be established for the producer. As it stands, the September 15th release has determined that no adjustments to the Federal Order are needed. That means everything will stay exactly as it has been for milk producers, poolers and consumers alike. This is lengthy and I apologize but, I think some things need to be air and discussed on the Herd Retirement Program. I am a farmer. It’s in my blood. It’s my way of life. I know there are others out there in the world just like me. We are a tough breed who will live off making just enough money to cover the bills and sometimes go without for stretches not being able to make ends meet. As a farmer, I think we feel we have a commitment to provide the world with food, including milk. Sometimes, our passions outweigh what we know. Losing businesses rarely stay in operation for three or four years without showing some ink in the black, profit zones. I am also a consumer, one that pinches every penny possible. I am concerned over soaring prices everywhere and extremely concerned about other people making ends meet when soaring grocery bills are taking up a larger chunk of their paychecks. A recent article called Milk Money in the City Pages has taken me back many years to my youth. It’s brought back memories of working with my Grandpa at a young age to assist all I could in the barn. I loved it. It was my one sanctuary in the world, that barn was my life line. Back to the article, my spouse and farm partner was operating a 30 cow dairy at that time. His parent’s were also. Both farms were sold off under the program. Rich’s were sold off prior to the big government push in 1985 and his parent’s were sold off under the direct program listed in April of 1986. My grandfather, who had lost his home due to a fire and in turn his farm in 1982, was irate that he hadn’t held on long enough for the buyout. I will admit I was too young to fully understand what was going on at that point. All I knew is that I loved spending time in the dairy barn and it was gone. As the years progressed, some people still refer back to those times. Even Rich was confused over why the USDA had even offered the program. Milk prices didn’t change. All he knew is that he no longer had a farm. After talking with him about it at length last evening, nearly 30 years later, the only benefit he saw to the program was that his payment paid off all of his over-extended bills and provided him with an escape from his farm debt and the ability to keep his sixth generation farm land. He also stated that he received a payment of .40/hundred weight of milk produced and still received another .35-.40/lb for each animal sold. On a 30 cow dairy with a herd average of 14,000 pounds of milk produced, that alone was a payment of around $168,000. Right now the milk prices are around $17-$18 per hundred weight of milk paid to the farmers. In 1985 when Rich sold out, milk prices were around $14 per hundred weight. It was a little cheaper for grains but only by about $60 a ton. Actual on farm production prices were actually higher than they are now. The newer fuel-efficient tractors that have come into the market place and advancements on machinery have changed drastically since those days. In 1985, most farms were still using small square bales for feeding. 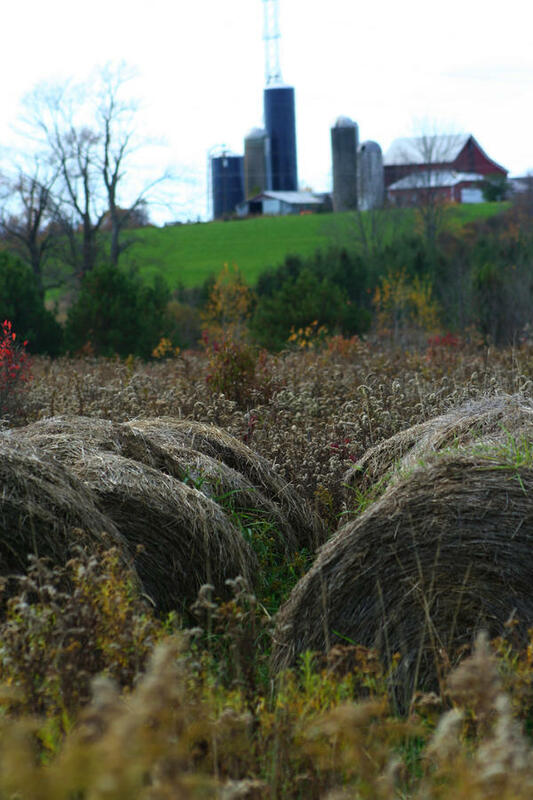 Now the use of large 3’x4’ square bales and round balers are prevalent. General speaking, the overall cost of production and feed inputs when including the labor involved probably ranked on a higher dollar value back in the early 80s. One thing that needs to be understood about that program is the general concept. The concept was that we had too much cheese, butter and yes, milk in storage. At that time, we also did not have the trade agreements that we now have with countries like China either. China wouldn’t even talk to President Reagan. But, the question is, what was the purpose? The purpose of the program was to limit the amounts of products that were going into storage. One thing people do forget is that all milk products are perishable, except for powdered milk. Times were different then, we didn’t have the advancements and extent of understanding that we do now about export markets and the commodity value of things like exported cheese. Here these perishable goods sat in storage, paid for by the government by tax payer dollars with thousands of tons being sent to landfills every year. Did the program work? Maybe as a short-term program it did. The levels of items going into storage did reduce. But what happened long-term is that many small farms that were struggling to make ends meet got out of the industry and larger farms just continued to expand. You can almost pinpoint the spike in growth of large commercial farms in correlation with this program in the 80s. Let’s jump forward to today. There are groups working as cooperatives to compete with commercial-scale dairies. We have lost the mentality of quality over quantity. Now, it’s all about who can produce the most milk with decent protein levels (because that’s the newest standard) for the cheapest inputs. It’s a tough, competitive world out there. I can name five small farms in my area that still can’t produce the amounts of milk being shipped from one commercial dairy. So, you might ask, who can keep feed cost down the best? Commercial dairies around me have started getting in Mexican or Honduran farm hands about five to ten years ago. This actually keeps their labor costs down. Good farm help is difficult to find and especially ones that work like immigrants do. Smaller farms don’t have the accommodations to provide room and board for one, let alone more. They depend on local help and in turn those local folks want to get paid a fair wage. Which, I honestly can’t blame them, it’s hard work. Now that you know the difference in labor, let’s look at crop production. Crop production for the small farm includes using smaller tractors which take longer to get crops done. A small farm might take 3 days to get in 50 acres of crops. Large commercial farms gather their drivers, their big equipment and blast out 150 acres in less than two days. On a pound per pound, the commercial dairy can produce chopped hay for feed for about .65 per cow per day while the small farm costs about .85 per cow per day. Over a 100 cows being fed the same amounts, that’s a total of over $7000.00 difference per year. When feed grain prices skyrocket like we saw in 2010, which also cuts into the small farms profit margins. The large dairy can afford to have large loads brought in and have ample room for storage. But, the small farm might not have the room for storage and also runs the risk of grains souring prior to use because of the low amounts used daily. A quick comparison: Large farm orders in bulk at 7.15 per bushel (56 lbs) and the small farm ends up paying about 7.50 per bushel. At 8 lbs of grain per cow per day, that’s five cents more per cow per day. For each 100 cows, that’s another $1800 per year. Why am I explaining all of these differences? I explain them because I think it’s important for the general public to understand the comparison of profit margins. Both of these farms are still getting paid the exact same amount for milk. They both still have taxes, insurance, tractor payments and electricity that are all about equal. My question to all is now this: If you are and have been committed to something you love and do with a passion, what would it take to get you out? If you have the option of receiving enough money to pay off all of your debts and have a little bit left over, would you take it? Knowing the farmers mentality, I know it would take a lot for me to get out of farming and probably the only thing that would be is financial security. As for milk price-fixing, I think that some of this does tie back into keeping the milk prices as stable as possible. I know people want cheap milk and I can see the argument that this isn’t a good policy. It is about how much money you spend out of your pay for the food you eat and the milk you drink. But, one thing that seems to be missing is the understanding that farmers cannot continue to make milk with payments of $10.00 per hundred weight of milk like we saw in 2009, especially when milk production costs for feed, fuel, etc are at an average $11 per hundred. If a cow produced 100 lbs. of milk per day, that means the farmer loses a dollar a day, per cow! You cannot build profits doing business like that. We have all got to work together and understand the system. I know many of you think that milk should just be produced on a day-to-day basis and the more produced, the cheaper it becomes. Unfortunately for farmers, even though we love what we do, it’s still a business and we still need to make money. Milk is a commodity, not much different that the oil used to fuel your car. It works off the supply and demand system but sometimes, we have to add more units to storage to keep the prices cost-effective and sometimes we need to purchase more to keep up with the ever-growing demand. It isn’t an easy job to watch and predict the markets. Milk production is controlled through that same mentality. Right or wrong, the people who produce the milk from cows they own still have the ultimate decision to make. There are a great deal of flaws with our system, with that I will not argue. But, in today’s markets everything is volatile. It doesn’t matter if it’s oil, milk, grains, meat or stocks. It all jumps around so fast it’s hard to keep up sometimes. As a producer, the volatility creates high risk for me when I am locked into just milk production. The retirement program allows a farm with what I like to call a niche market and singular product (and a system I need to clarify that I do NOT promote) the risk is huge to make profits on a continual basis. Do I feel that in today’s market the retirement program is needed? The simple answer is NO, I don’t. With the droughts in the Southwest, meat prices are on a slow and steady incline, expected to raise beef prices approximately 8% in 2012. A little known fact too many is that approximately 1/3 of the beef on supermarket shelves is actually derived from cull cows from dairy farms. The price increases for cull cows has been tremendous over the past year. In 2010, we sold an animal at auction and received a check for $719. In 2011, we sold an animal at auction (two pounds difference in weight) for a payment of $1010. As a good producing cow, her worth is between $900 and $1200. Since cull cows are one’s that usually start having breeding problems, she is definitely worth more as beef. There is a great deal of additional underlying issues to the retirement program as well. Many of these farms that are utilizing this program are not properly managed to begin with. Today’s dairy farms require extensive paperwork to track and maintain feeding programs, breeding protocol, animal health and animal welfare. The farms today that are prospering are not the farms we knew growing up. They run like well oiled machines with every consideration taken into account for overall farm production. There is also the issue of the age of the farmer. These buyout programs offer them a way to retire. Unfortunately, as with the hiring of immigrants to do farm labor there just aren’t the people willing to work the life of a farmer anymore. With no one to transition into the farm, it makes it difficult for a farmer to just walk away. Remember the commitment of a farmer to produce food, that doesn’t leave us as we age. As you can read, I sit on both sides of the fence on the herd retirement program. In some ways, for some folks, I think it is an option. While I sit on the fence, I also see an ever-growing demand for milk here in NY due largely to yogurt manufacturing in the state but, it isn’t like that in all states. I also see the consumers demand for cheap milk and I understand the issues of affordability. But somewhere along the way, we all need to decide that farms still have to make money to survive and we need to ensure a stable market with limited risk for new farms to develop. I don’t have the answers and half the time the more research I do the more questions I have. My concern is that through these programs we are leaving out the small farms that make up the back bone of quality in this country. We are pushing toward the highest production costs for food in recorded history but milk prices have been staying within the same range for at least three decades. Where and how is our milk going to be produced in the future? Why would the younger generation come into a dairy farm knowing that they won’t get any type of raise (from profit) during the remainder of their lives? Our biggest concerns should be quality and affordability for all. How can that be achieved without government buyouts? I honestly do not know. As you sit down to dinner each night, do you think about where your food comes from? While walking the isles of the grocery store, do you ever think about what’s produced in your state or region? Lately, there is much conversation about antibiotics in meats and milk, along with a heavy conversation about GMO’s. As a consumer, it made me sit back and think about where I got all of my information that is stored in my head about the food I eat. As some of you already know, I also work on another farm. That farm is a 76-head dairy farm that produces milk that goes into our supply chain. That milk can become bottled milk, yogurt or cheese. I have talked and asked lots of questions over the years about the milk that goes into the tank for pickup. I have asked lots of questions about what happens to the milk from treated cows. 1. About how much milk do your cows produce? Our herd average is 80 pounds of milk per day. The system is mandatory for the USDA regulations. It is the safest way to transport milk from the cow to the milk house. It is a closed loop system that prevents air from within the barn to enter into the lines and reduces the opportunity for air-borne bacteria to enter the system. 3. With the closed-loop system, do you still pay close attention to the cleaning process? Yup, it is mandatory that the system is flush and cleaned with an approved cleaner to make sure that all of the milk held within the line is removed. Even our milking claws (that’s the piece that fastens to the teats of the cow) is fulling cleaned and heated with 180 degree water to ensure a sterilization process too. We use a pail milker to remove just enough milk from that cow to relieve the pressure and fullness of her udder. We use the pail to make sure that the milk never reaches the bulk tank. The colostrum or mother’s first milk is feed to the calf. Any remaining is dumped out and unusable for any type of consumption. No other calf gets the colostrum and no human gets it either. A vet usually checks them to make sure that our preliminary diagnosis is correct and then we typically treat the animal with antibiotics to help her fight off the infection. 6. Once you treat them, what happens to their milk? All of her milk is dumped. She is milked into the milk pail and the milk is then discarded. It isn’t acceptable for the bulk tank. 7. What happens if the milk gets into the tank? When the milk is tested at the delivery site, if it registers back that the milk is contaminated with antibiotics, the whole truck gets dumped. The trucking company will then back track the milk in that load to the farms it was picked up from. If it is discovered that is from our farm, we are responsible to pay for the loss of the whole truck of milk. One load tracked back to our farm could put us out of business. *Special note- Some milk pick up companies do a dip test at the time of pick-up. 8. How much milk do you send on a truck? We send approximately 10,000 pounds of milk every other day. Since a gallon of milk weighs approximately 8.5 pounds, that means we ship 1176 gallons of milk. 9. Wait, they only pick up milk every TWO days? Yes, we have a chiller attached to our tank to ensure that the milk is kept at 45 degrees. All milk that enters the tank MUST be chilled to that temperature within two hours. When we do additional milkings, the tank can NEVER go above 50 degrees. Ultimately, the milk is pasteurized at temperatures about 160 degrees to kill any bacteria that may enter the milk. 10. Do you drink milk from the tank? Yes, we do take about a gallon, maybe two, a week to drink ourselves. We do not pasteurize for our own consumption. I hope that these questions and answers help those who were curious and concerns about antibiotics within the milk supply chain. If you have any further questions, comments or concerns please leave a note or comment below. We will take the time to answer them all.